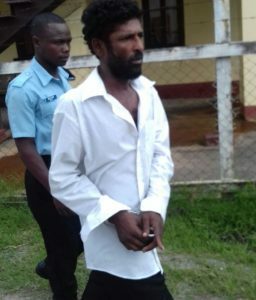 A Williamsburg, Corentyne mason added murder to his rap-sheet after he was slapped with the charged today at the Reliance Magistrate Court. Forty four-year-old Ivor Thom of Lot 16A’ Williamsburg was not required to plea to the indictable charge when it read to him by Magistrate Renita Singh. He was not represented by an attorney-at-law. 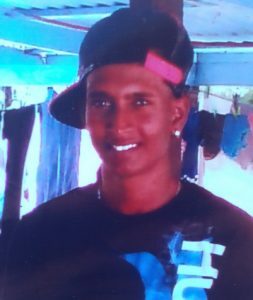 The court heard that on Sunday 27th August, 2017 at Williamsburg village, Corentyne, the accused murdered 19-year old Vishram Mohabir. He was remanded until 12th September when the matter will be called again at the Ablion Magistrate Court. The accused had previous brushes with the law in 2013 and 2014 with criminal offenses including using threatening language, assault, wounding and trafficking narcotics among others. Demerara Waves previously reported that two brothers were stabbed by a forty four-year-old man in the wee hours of Sunday morning. One of the brothers succumbed to his injuries at the New Amsterdam Public Hospital minutes later. Dead is 19-year old Vishram Mohabir called ‘Ajai’ of 258 Ramphal St, Williamsburg, Corentyne. His brother, 16-year old Kunal Singh sustained stab wounds to the right arm and left palm. Singh, who witnessed the altercation has told this publication that at around 3:00 am that morning, they were attending barbeque at the Highest Grade Car Wash and Bar when the suspect who was allegedly intoxicated at the time came up to him and dealt him several stabs to his hand. He stated that he ran to his brother who was standing a few feet away and they returned to the suspect to inquire what was the issue. It was then that the man stabbed Mohabir once to the neck and ran off. He was subsequently apprehended by police officers who were in the area. When asked if they had any problem with the suspect, Singh replied in the negative noting that they were just ‘standing having a good time’.